A fun educational way to play with SpongeBob SquarePants on the VSmile systems. This video game cartridge contains 13 activities. Nine are a part of a learning adventure and four are located in a separate section called the Learning Zone. If kids opt to participate in the adventure, they join SpongeBob as he goes through his day and each of the things he does translates into an educational arcade game. To wake SpongeBob, kids pop dream bubbles that aren't filled with the image of a word located at the top of the screen. To help SpongeBob get dressed, kids match pairs of rhyming words in his closet. 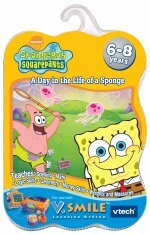 Before going to work, SpongeBob fishes with Patrick by netting numbered jellyfish that complete patterns or answer multiplication problems. At the Krabby Patty, kids assist SpongeBob in cooking lettered patties to spell words. Other activities include skiing down a sand mountain while handing out leaflets to odd or even numbered skiers, driving boats to solve logic problems, making correct change in a party store, and dancing at a party while matching colored confetti with colored buttons. The Learning Zone provides kids with four more activities that focus on matching geometric shapes, finding differences between two photos, working with weights and measurements, and completing number sequences. All the activities can be played on two levels of difficulty. While playing the learning adventure, the cartridge will save the progress of the player as long as the cartridge is not removed from the unit. A Day in the Life of a Sponge offers a large number of varied activities. Some are better than others, but kids can simply skip the ones that don't interest them. We tested this software on both the VSmile TV System and the handheld VSmile Pocket. A few of the graphics were hard to distinguish when playing on the smaller handheld version and thus players were unable to accomplish the educational objective of the game. For example, because they could not read the number on a passing skier, players could not determine if it was odd or even.